The Chinese language is traditionally taught through a series of between roughly 180 and 215 radicals. These radicals are then used to form the characters of the Chinese language. Chineasy has broken down this collection of characters into their most basic and recurring forms, allowing students to learn fewer and simpler radicals that we have termed ‘building blocks’. One building block, or a specific compound form of the building block can be combined with one or more other characters to make a compound character. Two or more independent characters can be placed next to one another to make phrases. In compounds, a whole new character is created; in phrases, the placement of characters next to one another gives a new meaning to the collection of characters. 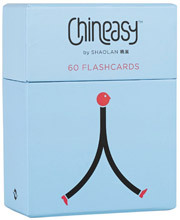 This principle of building blocks is what makes Chineasy so easy!